Want to make it easy for your listeners to tap directly through to sponsors? Skip over spoilers if they aren’t caught up? See what’s coming up in your episode? Let Podcast Chapters help. From exporting your podcast out of your audio program, to having an MP3 file with chapter markers ready to post, Podcast Chapters is the fastest way to get your podcast in the hands of your fans. 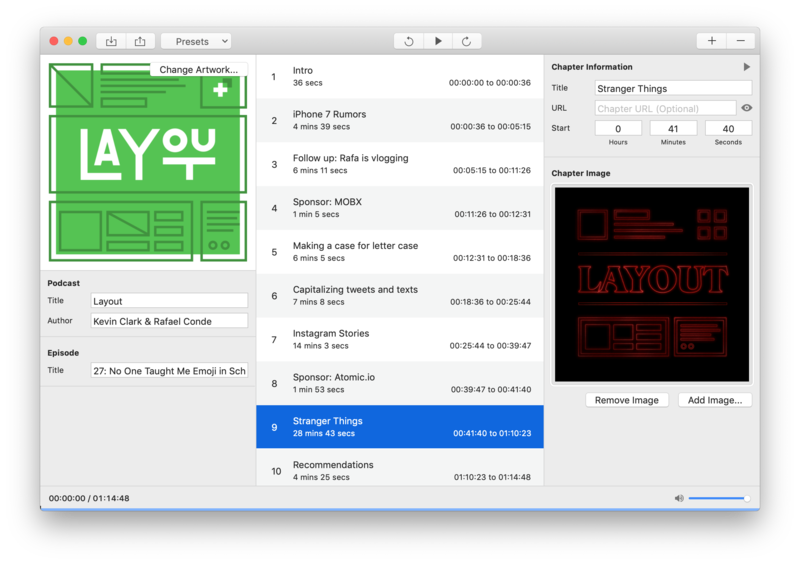 No complex export settings, no pages of preferences, and the shortcuts you already know. You import your file, add the chapters, then export it. It just works. If you're not sure where to drop your chapter markers, listen back in Podcast Chapters. Adding a new chapter marker will drop it automatically at your current position. No need to go into iTunes and set metadata tags, Podcast Chapters now lets you set the podcast and episode metadata, including your show art. Do you edit multiple podcasts? Save time with the presets system in Podcast Chapters. Save your shows with pre-set metadata, including the show art. Never spend hours searching for that one image file again. No uploading, using a clunky web interface, and re-downloading. Podcast Chapters is designed for the Mac you use and love, by someone who uses and loves it too. Use and love Podcast Chapters? Want your podcast here? Let me know.